Pet urine starts to smell like ammonia very quickly. Bacteria starts breaking urine down immediately, urine contains nitrates, which are the essential building blocks of ammonia. And the ammonia is what smells. What neutralizes ammonia? Baking Soda. Baking Soda’s deodorization power is a result of its ability to absorb and neutralize odor, rather than only covering it up. This baking soda box holder mounts (screws included) under the Top Lid, each time the Top Lid is opened, the baking soda is mixed. And a baking soda box slides in and out easily for replacement. 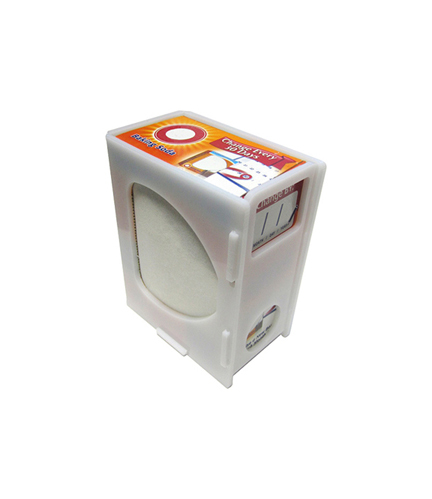 My Odor Absorber can be use with any litter box cabinet. You will need to pick up a few boxes of “@rm and [email protected] firdg and frezor” baking soda boxes to use with the holder. (Box of Baking Soda NOT included.) The fact is, cat poop stinks! Most cats cover up, some “dump and run”. Nothing is going to get rid of that odor except by removing and getting ride of the poop. Keeping the litter box clean is essential. My Out of Sight Litter Box is designed to be easy to clean. Just walk up, open the Top Lid, scoop, and walk away. A minute in the morning and a minute at night, and your cat and your nose will both be happy. * I use the word "stop(s)" to describe the difference (before to after) that my Out of Sight Litter Box will have on your litter tracking issues. that you too might use the word "Stopped" while telling your friends how the Out of Sight Litter Box changed your litter tracking issues. Copyright© 2019 Out of Sight Litter Box, Inc.
Out of Sight® and (logo) are registered trademarks of Out of Sight Litter Box, Inc. Your answers are 100% Anonymous. If you want a reply to your comments or questions, please email me. [email protected] Thank you for your investment of time. Thanks for answering! There is no such thing as perfect or complete... only continuous improvement. I learn, by listening.